Analysis of engagement of serotonin-modulating anticonsolidation protein (SMAP) in formation of drug addiction to morphine in self-administration model in the rats via application of the anti-SMAP antibodies. Indirect ELISA-test, morphine self-administration model, conditioned model of alternative running, conditioned model of instrumental differentiation. Upregulation of SMAP by 67% in the brain cingulate cortex of the rats with stable level of morphine intake, while no changes of SMAP level were noticed in hypothalamus. Intramuscular administration of the anti-SMAP antibodies to the rats with stable level of morphine intake leads to significant suppression of morphine consumption for 8 days. Administration of non-immune γ-globulins does not have any effect on morphine consumption. Intra-cerebral administration of the anti-SMAP antibodies leads to significant acceleration and strengthening of memory formation in complicated conditioned alternative running and instrumental differentiation models. Application of the anti-SMAP antibodies induces suppression of elaborated drug addiction in the rats, first, through blockade of intra-cellular transduction of serotonin signal in the concerned nervous cells and, second, due to formation of negative memory on inefficacy of lever pressing to get bright positive emotions after morphine self-administration. Due to wide spreading of drug addiction pathology among different groups of population, in the most countries it grew from just medical problem into social problem. This pathology is worsen by the fact that addictive drugs are engaged in the turnover of the brain cells, disturbing roughly neurotransmitters’ turnover and finally bringing to profound impairment of emotional background and degradation of patients’ intellectual level. It should be recognized that currently there are no reliable and effective ways of treatment of drug addiction leading to prolonged and retainable remission from this pathology without risk of its reset. Results got in different experimental models on the animals, showed that addictive drugs of different chemical origin srealize their activities and induce formation of clinical picture of drug addiction through profound disturbances in serotonin turnover [1,2]. After administration of addictive drugs, an acute upregulation of serotonin level in the organism is observed, and its concentration normalizes gradually as the drug is metabolized and excreted from the body. In the in vivo application of the microdialysis method in the rats, after cocaine self-administration, an upregulation of more than 340% in the baseline extracellular serotonin concentration persist for 12 h in the nucleus accumbens . In the case of a regular administration of addictive drugs, the serotonin content in the whole organism downregulates acutely if there is a long-term pause in drug administration, which induces grave suffering in patients (the abstinence syndrome). In the same work, withdrawal of the rats from cocaine intake resulted in a significant downregulation in the serotonin level in the nucleus accumbens relatively to the controls (0.6 ± 0.3 nM vs. 2.0 ± 0.5 nM, correspondently; ). Similar results were got as well on the monkeys Saimiri sciureus with per-oral and subcutaneous administration of 3,4-dimethylendioximethamphethamine (MDMA;). An upregulation of serotonin in the organism of the addicts during drug administration does not simply coincide in time with dependency formation, but, as it appears, actually underlies it. Particularly, the studies of Ch.P.Muller with colleagues  showed that changes of serotonin turnover underlie formation of drug addiction to cocaine, amphetamine, methamphetamine, MDMA, morphine and heroine. Besides, this premise is directly supported by the studies showing that micro-application of serotonin to the neurons of ventro-medial nucleus of the rat hypothalamus, which are involved in elaboration of drug addiction (revealed by intracellular registration of neuronal activity), leads to the same pattern of changes in neuronal activity as it is observed after administration of a single dose of morphine . The presented data confirm the specific role for serotonin as a neurotransmitter responsible for specific effects of addictive drugs on the brain neurons. Taking into account very hard negative sufferings of addicts, related to steep downregulation of serotonin in their organism in the time lapse between inputs of addictive drugs and making patients to administer them again, one can come to a conclusion that main efforts in treatment of these patients should be directed to interruption of conditioned connection with reinforcement in the form of complex of bright positive emotions, whose formation is induced in the patients under regular intake of such drugs. Considering the ways of interruption of conditioned connection with reinforcement and possible point of application of blocking impact of correcting agents, it should be borne in mind the fact that serotonin realizes its functional activity on sub-cellular level in the nervous cells through activating certain genes and synthesis of specific serotonin-regulating proteins [6,7]. In our earlier studies in the rat brain cortex was identified and from the whole rat brain was purified serotonin-modulating anticonsolidation protein (SMAP) . As showed biochemical and electrophysiological studies, SMAP is in linear relation with serotonin and realizes serotonin functions on sub-cellular level in the nervous cells [8-10]. Intracerebral administration of this protein to the rats prior to learning sessions leads to significant impairment of memory consolidation in the conditioned models of passive avoidance and shuttle box [8,11]. Taking the above mentioned data into consideration, we decided studying engagement of SMAP as a serotonin-modulating protein in formation of drug addiction to morphine in selfadministration model in the rats via application of anti-SMAP antibodies. SMAP was purified from the cow brains. The brains were homogenized in extracting buffer, containing 0.05 M phosphate buffer (pH 7.2), 0.3 M NaCl, 5 mM EDTA and 0.1% Triton X-100 in a volume ratio of tissue and buffer as 1:4. The main stages of SMAP fractionation were: 1) precipitation by ammonium sulfate under final concentration of 40%, 2) gelchromatography on the column (3 × 60 cm) of Sephadex G-150. The process of fractionation and selection of immune positive fractions was carried out under screening control of solidbased indirect ELISA-test with application of the anti-SMAP polyclonal immunoglobulins . Homogeneity of the purified protein was evaluated by electrophoresis in polyacrylamide gel in tris-glycine buffer system (pH 8.3). The anti-SMAP immunoglobulins were produced as a result of 5-6-month immunization of the rabbits through subcutaneous injections of 300 μg of the purified protein to each rabbit, always in mixture with the complete Freund adjuvant (Sigma, Germany). The immunization schedule was as follows: first three injections with 14-day interval, thereafter one injection a month. The blood samples were taken from the edge ear vein of the rabbits 10 days after the 3rd and following injections, serum was isolated and the immunoglobulins were precipitated from the serum by adding equal volume of 100% solution of ammonium sulfate. Evaluation of SMAP level in the brain structures of the rats was realized by the indirect solidbased ELISA-test on the polysterene plates with moderate level of adsorption (Sigma, Germany) with application of the anti-SMAP polyclonal immunoglobulins. Owing to implication of the brain cingulate cortex in reinforcement processes of different modalities and hypothalamus – in regulation of vegetative functions of the organism, total proteins of these structures were used as the antigens in the ELISA-test. The total proteins were extracted from these structures in the extracting buffer (pH 7.2) and their concentrations were leveled to a common concentration 20 μg/ml with application of 0.1 M tris-HCl buffer (pH 8.6). Each sample was repeated three times and after finalizing the reaction, the mean value was calculated basing on the values of three repeats. The level of the total proteins was determined by the method of Bredford with application of 0.01% solution of Coumassi brilliant blue G-250 on the wavelength of 595 nm. The rabbit anti- SMAP immunoglobulins were used as the first antibodies in the ELISA-test, and the goat anti-rabbit immunoglobulins with conjugated horseradish peroxidase were used as the second antibodies. The reaction was visualized by adding the substrate of horseradish peroxidase – 0.05% solution of orthophenylen-diamine in 0.05 M citrate-phosphate buffer (pH 4.5). The reaction was stopped 20 min after substrate addition with application of 3 M solution of NaOH, and the digital results of the reaction were taken in the photometer for the ELISAtest “Spectra Max 250” (Molecular Devices Co., USA) on the wavelength of 492 nm. As a result of application of different concentrations of SMAP, on the basis of the results of the ELISAtest, the calibration curve of relation of decimal logarithm of different SMAP concentrations to the values of optical units of extinction on the wavelength of 492 nm was plotted. Basing on this curve, the SMAP level was calculated in the studied areas of the rat brain cortex. The results of the studies were averaged within the groups and analyzed by t-Student’s criterion. Anti-SMAP polyclonal antibodies were purified from the solution of anti-SMAP immunoglobulins, obtained as a result of immunization of the rabbits with this protein, through a technique of immune-affinity chromatography on the column of CNBrsepharose (Sigma, Germany) with immobilized SMAP. After loading the anti-SMAP immunoglobulins onto the affinity column, it was thoroughly washed with 20-fold column volume of 0.01 M phosphate buffer (pH 7.2) and thereafter under the control of measured extinction on 595 nm (method by Bredford), the specifically bound anti-SMAP antibodies were eluted with chaotropic substance – 3 M solution of KCNS. The eluted antibodies were immediately put on dialysis against 0.15 M solution of NaCl buffered to pH 7.2 with NaH2PO4 and then frozen. In one cycle up to 12 mg antibodies were eluted from the affinity column (the level of antibodies was defined by the method by Bredford). The studies were conducted on male Wistar rats of 180-220 g of mass. Drug addiction was elaborated in the rats using the morphine self-administration model. Prior to elaboration of drug addiction, special ratdesigned catheters were introduced into the jugular veins of anesthetized (sodium ethaminal, 40 mg/kg) rats from the experimental group, and the thick opposite ends of the catheters were led under the skin and fixed on the back of the animal’s neck. After recovery from the surgery, the rats were put into the experimental box individually to acquire addiction to morphine. The experimental box (60 cm × 60 cm) contained two levers, fixed to the back wall at a distance of 15 cm from each other; one of the levers was connected to a peristaltic pump by silicone tubing. Each pressing of the lever by the rats resulted in automatic delivering of 50 μL of 0.2% (100 μg) morphine into the vein. In the first series of studies the animals were culled into two groups: (1) intact group (n=6), and (2) experimental group (n=6) – animals were subjected to formation of drug addiction. After the animals became addicted to morphine and reached a stable dose of its consumption, the animals were sacrificed, and the hypothalamus and cingulate cortex were removed and watersoluble proteins were extracted and used as antigens in the indirect ELISA test. The results of the study were grouped and analyzed on Mann- Whitney’s U criterion. In the second series of studies, after the rats reached constant level of morphine intake, they were culled into two groups: (1) the experimental group (n=9) – the animals were administered intraperitoneally with rabbit anti- SMAP polyclonal antibodies, and (2) the control group (n=10) – the animals were administered with non-immune rabbit immunoglobulins. Both preparations were used at a ratio of 1 mg/100 g of body mass. The results were grouped and analyzed by on multifactorial Fridman’s χ2 criterion. In the third series of studies behavioral experiments were conducted on the 5-6-monthold Wistar male rats in the complicated and timeconsuming instrumental model of alternative running with food reinforcement . The experimental box was constructed of plastic glass and had dimensions of 60 × 60 cm. To the left and right corners, at a height of 16 cm from the bottom of the box two platforms, having sizes of 20 × 10 cm, were secured. In this series of studies the rats were culled into 3 groups: (1) intact group (n=13); (2) control group – rabbit non-immune γ-globulins (n=13); (3) experimental group – rabbit anti- SMAP antibodies (n=12). The animals were anesthetized with natrium etaminali (40 mg per 1 kg of body mass) and administered with 10 μl of preparations at a concentration of 1.5 mg/ ml in saline buffered to pH value of 7.2 into the brain left lateral ventricle. The learning sessions were undertaken 24 hr after administration of the preparations up to reaching of 50% criterion of correct trials. In this case the latencies of the first trials towards the platform and ratio of correct trials to total amount of trials in percent were measured. The animals of the control group as the animals of the experimental group were deprived for food and placed into the experimental box for the time similar to the animals of the experimental group. The animals from the experimental group were placed on the start at the entrance to the experimental box and their turn-by-turn running and jumping onto the right and left platforms were reinforced by food pellets put on them beforehand. The food pellets had a mass of 200 mg and included sunrise oil, wheat flour, ground maize grains and mixed fodder. After animal’s running towards the platform and eating the food pellet on one side, it was taken from the box and placed again onto the starting point and its running to the opposite side was reinforced. The food pellets were put onto the platform at the very moment, when the animal had been out from the box and therefore it could not see which platform the food pellet was put on. The learning sessions of the animals lasted daily for 7 days, 20 trials in each session. The trial was considered as successful, if after being returned to the start, the next trial was realized towards the platform on the opposite side. Learning criterion was calculated as a ratio of a number of correct trials to a total amount of trials realized during one learning session. In the fourth series the studies were carried out in the conditioned instrumental differentiation model. During the learning sessions the animals were trained to press right lever of two levers secured to the back wall of the experimental box close to each other to get food pellet as reinforcement. The animals were culled into 3 groups: (1) intact group (n=13); (2) control group – rabbit non-immune γ-globulins (n=13); (3) experimental group – anti-SMAP antibodies (n=12). The animals in this series of studies were administered the preparations the same way and the interval between injections and beginning of learning sessions were the same as in the third series of studies. The results of the third and fourth series of studies were grouped and analyzed on Student’s t-criterion. Prior to elaboration of instrumental task of selfadministration of morphine the rats were placed into the experimental box for several days for the purpose of their adaptation to surrounding signals and learning to press the levers. In the course of elaboration the rats showed sustained increase of morphine intake in regime of selfadministration for several days with following reaching certain stable level (plateau) which was individual for each animal. In this case, the values of stable level of morphine intake varied within the range from 2.8 to 4.7 mg (from 28 to 47 pressing the lever) during 40-minute test. After placing into the experimental box the animals with formed task rushed without delay to the lever, joined to the pump with morphine container, and pressed it up to reaching their saturation in that experiment. Thereafter the animals lost their interest to the lever. In the first series of studies, after the animals became addicted to morphine and reached a stable dose of morphine consumption, they were sacrificed and the hypothalamus and cingulate cortex were removed from their brains. As the results of indirect ELISA-test showed, in the rats with elaborated drug addiction, SMAP was found to be upregulated by 67% in the cingulate cortex (intact group: 117 ± 14 ng/ml, experimental group: 197 ± 16 ng/ml; p=0.01on Mann-Whitney’s U criterion), whereas its level did not change in the hypothalamus (106 ± 5.9 ng/ml and 109 ± 5.6 ng/ml, correspondently; Figure 1). Due to the fact that all animals of the experimental group by the end of the experiment had similar values of morphine intake, it was impossible to reveal correlative relation of SMAP level in the cingulates cortex of these animals on the morphine intake. The revealed character of changes of SMAP level in the studied brain structures, apparently, indicates to its direct engagement in realization of positive reinforcement effects of morphine. Figure 1: Changes in SMAP level in the brain structures of the morphine-addicted animals. ** - p <0.01 by Mann-Whitney’s U criterion. In the second series of studies anti- SMAP antibodies were administered once intramuscularly to those rats that achieved stable level of drug addiction. In this case one injection of anti-SMAP antibodies to the addicted animals led to many-fold decline of the morphine intake (p<0.008; Fridman’s χ2 criterion; Figure 2), which was detectable on the second, third, and eighth days after the injection (measurement of morphine intake by the animals for a longer time was difficult for technical reasons). When such animals were placed in the experimental box, they came up close to the lever, smelled it, but moved aside. However, control animals having constant levels of morphine intake did not change their consumption after administration of non-immune γ-globulins (Figure 3). As SMAP upregulation was observed in the cingulate cortex of the addicted animals, its involvement in the formation and persistence of drug addiction becomes clear. Owing to the serotonin-modulating nature of SMAP and in view of serotonin’s activity, one-time blockade of its activity with polyclonal antibodies, as in our studies, results in disruption of intracellular transduction of the serotonin signal, eliminating the positive reinforcing properties of morphine in the addicted rats. Thus, a single dose of anti-SMAP antibodies suppressed the positive reinforcing effect of morphine in the drugdependent animals. Figure 2: Effects of anti-SMAP antibodies on amount of lever pressing in the rats subjected to morphine self-administration. ** - p <0.008 by Fridman’s χ2 criterion. Figure 3: Effects of rabbit non-immune γ-globulins on amount of lever pressing in rats subjected to morphine self-administration. In our earlier studies we have found significant downregulation of SMAP in the brain cortex of the animals reached 80% of correct trials in acquisition of a task in different conditioned models . Taken together, these results suggest that the prolonged effects of anti-SMAP antibodies, directed to SMAP inactivation, might be related to induction of formation of negative memory trace on inefficacy of lever pressing to getting bright positive emotions as a result of morphine self-administration. In order to clarify the conjecture that antibody-mediated blockade of SMAP may result in promoting memory formation, we conducted the next two series of studies on complicated, time-consuming conditioned tasks. In the third series of studies administration of anti-SMAP antibodies into the brain lateral ventricle of the rats 24 h prior to learning sessions in the conditioned model of alternative running significantly facilitated elaboration of the task. Particularly, if the animals of the intact and control groups reached 50% learning criterion on 7th experimental day, then under the effect of anti-SMAP antibodies the animals of the experimental group reached it on 4th day (p<0.001; Student’s t-criterion; Figure 4). Furthermore, though the dynamics of downregulation of latency of the first trial towards the platform was observed in the all studied groups, nevertheless in the experimental group this downregulation bore steeper character (p<0.01; Student’s t-criterion; Figure 5). So, the obtained data indicate to stimulating effect of anti-SMAP antibodies on memory formation and, correspondently, to negative character of regulation of this process by SMAP. 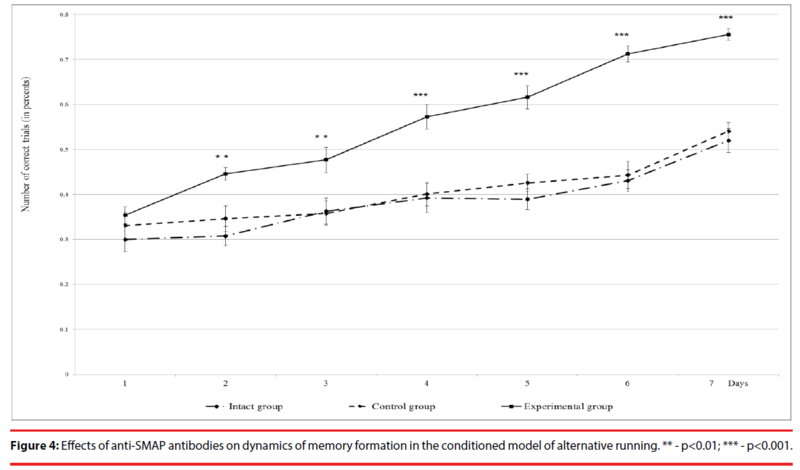 Figure 4: Effects of anti-SMAP antibodies on dynamics of memory formation in the conditioned model of alternative running. ** - p<0.01; *** - p<0.001. 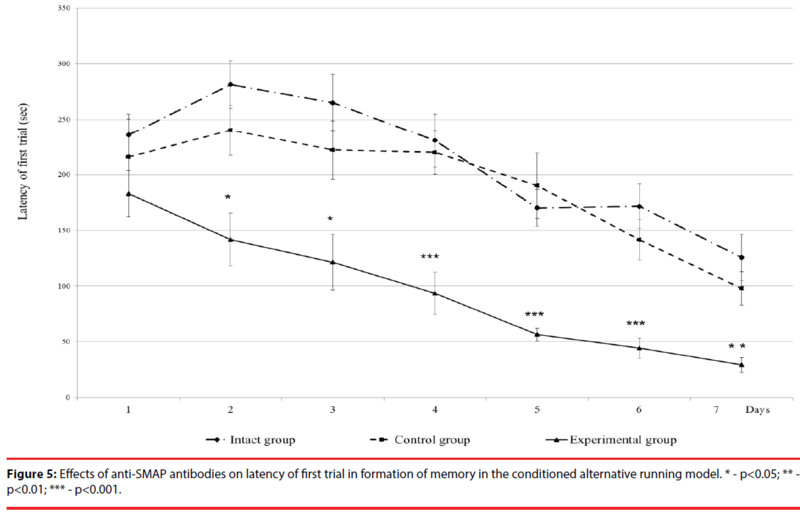 Figure 5: Effects of anti-SMAP antibodies on latency of first trial in formation of memory in the conditioned alternative running model. * - p<0.05; ** - p<0.01; *** - p<0.001. In the fourth series of studies administration of anti-SMAP antibodies into the brain lateral ventricle of the rats 24 h prior to learning sessions in the complicated and time-consuming conditioned instrumental differentiation model significantly promoted and strengthened formation of memory. If the animals of the intact group reached 50% criterion of correct trials on 7th experimental day and the control animals reached this criterion on 6th day, then the animals of the experimental group reached the level of 50% correct trials on 4th day (p<0.001; Student’s t-criterion; Figure 6). Besides, a hallmark of the rate of achieving 50% learning criterion, each group had its upper limit of correct trials (plateau), no matter how long the learning sessions lasted. So, the plateau for the animals of the intact group made 50%, the plateau for the control rats – 55%, and the plateau for experimental group – 80% (Figure 6). As in the fourth series, the dynamics of downregulation of latency of the first trial towards the lever was observed in the all studied groups, however, in the experimental group this downregulation was much steeper (p<0.01; Student’s t-criterion; Figure 7). 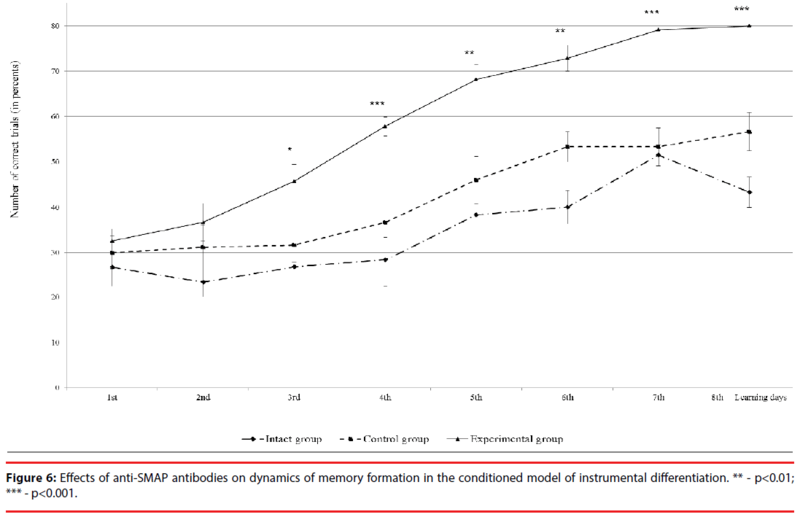 Figure 6: Effects of anti-SMAP antibodies on dynamics of memory formation in the conditioned model of instrumental differentiation. ** - p<0.01; *** - p<0.001. 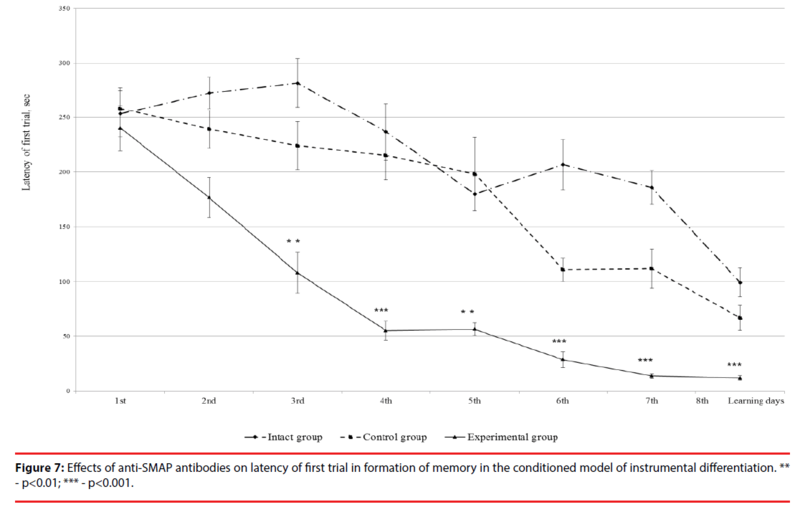 Figure 7: Effects of anti-SMAP antibodies on latency of first trial in formation of memory in the conditioned model of instrumental differentiation. ** - p<0.01; *** - p<0.001. So, the obtained results in these series of studies indicate to direct implication of SMAP in formation of drug addiction through intracellular transduction of serotonergic signal and that blocking its activity with antibodies interrupts transduction of serotonergic signal inside the concerned nervous cells. Along with it, as it has been proved on two complicated conditioned models on the rats (third and fourth series of studies), antibodies-mediated blockade of SMAP activity leads to formation of negative memory on inefficiency of lever pressing to getting bright positive emotions as a result of morphine intake. Basing on the existing data in the literature concerning upregulation of serotonin in the brain structures after intake of addictive drugs in the animals with elaborated drug addiction, one can propose that complex of strong positive emotions, developing in this case, is closely related to changes in serotonin level. Due to this reason, artificial downregulation of serotonergic system in the brain structures may prevent development of this complex of positive sufferings induced by intake of addictive drugs. The experimental approach, utilized in these series of studies and related to application of anti-SMAP antibodies, is based on serotoninmodulating nature of this protein that was proven in biochemical studies on the rat brain cortex, in behavioral studies on the rats on the conditioned passive avoidance and shuttle box models, as well as in electrophysiological studies on identified command neurons of the grapes snails [8-11]. In addition to the fact that in the above mentioned models SMAP induces the same effects as serotonin itself, it, as the results of studies of excitability and chemosensitivity of the identified command neurons of the snails have shown, as well possesses with several-time stronger serotonergic activity. In this relation antibodies-mediated blockade of its activity, obviously, may have more powerful effect on serotonin-launched processes in the nervous cells than blockade of serotonin itself. The revealed effective suppression of morphine intake in the rats with anti-SMAP antibodies demonstrates that upregulation of SMAP in the cingulate cortex in the animals, achieved stable level of morphine consumption, is not an accompanying phenomenon, but is an integral part of molecular mechanism of positive reinforcing effect of morphine in the nervous cells. On this basis immunochemical blockade of SMAP activity in the nervous cells might be considered as pathogenetic way of inhibition of positive reinforcing effect of morphine. The observed upregulation of SMAP in the brain cingulate cortex in the animals with stable level of morphine consumption, perhaps, is not related to formation of conditioned instrumental task, reinforced by morphine. This conclusion is made issuing from our earlier studies, conducted in the many-time conditioned model of shuttle box with electric shock reinforcement on the rats  and in the many-time model of alternative running with food reinforcement in the rats . The results of these studies demonstrated that formation of memory traces is accompanied with noticeable downregulation, but not upregulation of SMAP in the brain cortex of trained animals. On the other hand, upregulation of SMAP in the addicted animals, apparently, is not related to delivering morphine as a preparation into the animal’s organism due to the fact that forcible administration of morphine into the rats does not bring to any significant changes of levels of serotonin, dopamine or noradrenaline in the brain cingulate cortex, whereas in the regime of self-administration of addictive drugs noticeable changes of these monoamines’ levels are noticed . Presently intensive development of immunochemical approach for the purpose of correction of drug addiction on the animal models is noticed . The authors of such studies usually use chemically modified addictive drugs to immunizing addicted animals to produce in their organism autoantibodies against them. Though attractive features of this method, it is not free from drawbacks, one of which is related to the fact that in administration of big dose of a drug, the organism in short time is unable to produce additional amount of autoantibodies enough to blocking abundant dose of the drugs. Furthermore, (it seems to be the most important) due to narrow antigen specificity of the produced autoantibodies in the organism, they will be ineffective for suppressing drug addiction if any novel synthetic addictive drug is used, and immune response of the organism should be redirected against this novel drug from the starting point. However, the method of suppression of positive reinforcing effect of morphine in the animals with anti- SMAP antibodies, utilized in this study, has an advantage concluding in that that it realizes blockade of intra-cellular transduction of serotonin signal supporting formation of complex of bright positive emotions after delivering into the organism the addictive drugs having different chemical structure. In some articles successful application of immunochemical approach, particularly antibodies to serotonin and catecholamines for correction of drug addiction to morphine in the rats, is presented . While analyzing the results of the experiments, sustainable effect of the anti-SMAP antibodies on suppression of positive reinforces effect of morphine in the animals with stable level of its consumption lasting at least for 8 days. Prolonged effect of the anti-SMAP antibodies we explained by putative formation of negative memory on inefficacy of lever pressing to getting bright positive emotions. The experiments, undertaken in the third and fourth series of studies on the complicated conditioned models of alternative running and instrumental differentiation perfectly confirmed correctness of the presented conjecture. In both conditioned models intra-cerebral administration of the anti-SMAP antibodies significantly accelerated and strengthened formation of memory traces. Especially clear this effect was noticed in the conditioned instrumental differentiation model, in which upper available limit of correct trials for the animals of the intact and control group (plateau) did not exceed 55%, while the experimental animals reached 80% of correct trials (p<0.001). So, issuing from the results of these series, one can come to a conclusion that, besides interrupting serotonergic signal, the anti-SMAP antibodies as well promote formation of negative memory providing long-term withdrawal of animals from addictive drug consumption. Such result presents first step on elaboration of remedy directed to reliable and effective taking off psychic dependence on addictive drugs. The systemic administration of the anti-SMAP antibodies was utilized in this study with an aim of analysis of feasibility of application of this approach in the future in clinical practice. In this relation the reasonable question of possible permeability of the anti-SMAP antibodies through blood-brain barrier (BBB). The problem of permeability of the immunoglobulins through the BBB has been leaving the subject of numerous discussions. Up to date most of researchers demonstrated in experimental way and come to a conclusion that the BBB is permeable for the immunoglobulins. Particularly, it was shown that after systemic administration of polyclonal antibodies to S-100 protein to the rats, 30% of antibodies pass to liquor (the antibodies in the liquor were detected with indirect ELISA-test) . The capability to penetrate through the BBB as well belongs to the antibodies to nerve growth factor , to neuropeptide Y , compliment-binding antibodies to the receptors GABAB of neurons , antibodies to serotonin , antibodies to dopaminergic neuronal membrane antigens . Capability of the anti- SMAP antibodies to penetrate into the brain cells, passing through the BBB, was demonstrated in our studies, in which the rabbits were immunized with purified SMAP. In this case epileptic seizures in the form of myoclonic seizures and electrographic correlates of epileptic seizures in the cortical zones and colliculus superior were induced by administration into the amygdala the sub-threshold doses of penicillin, which in the intact animals did not cause manifestations of epileptic activity. These data indicate to decline of threshold excitability values in the neurons of the studied brain structures under the impact of the anti-SMAP antibodies passing through the BBB. So, the presented arguments indicate to actual passing of anti-SMAP antibodies through BBB and having dual effect on suppressing drug addiction, first, through interruption of transduction of serotonergic signal inside the nervous cell, underlying formation of bright positive emotions after addictive drug administration, and, second, by formation of negative memory trace impeding storage and retrieval of memory on such bright positive emotions. The authors are highly obliged to Correspondent Member of Russian Academy of Sciences, Doctor of Medical Sciences, Director of P.K.Anokhin Institute of Normal Physiology, Russian Academy of Sciences Sergey K. Sudakov for his valuable consulting support in planning and realizing studies presented in the article. The studies were partially supported by BioIndustrial Initiative Fund, USA (Grant №AZB2-20610- BA-08). Parsons LH, Koob GF, Weiss F. Extracellular serotonin is decreased in nucleus accumbens during withdrawal from cocaine self-administration. Behav. Brain. Res 73(1-2), 225-228 (1995). Perrotti LI, Beck KD, Luine VN, et al. Progesterone and cocaine admi­nistration affect serotonin in the medial prefrontal cortex of ovariec­to­mized rats. Neurosci. Lett 291(3), 155-158 (2000). Ricaurte GA, De Lanney LE, Irwin I, et al. Toxic effects of MDMA on central serotonergic neurons in the primate: Importance of route and frequency of drug administration. Brain. Res 446(1), 165-168 (1988). Müller ChP, Pum ME, Schumann G, et al. Role of serotonin in drug addiction. Handbook. Behav. Neurosci. 21(1), 507-545 (2010). Gasanov GG, Kuliyev EI. Neuronal activity of ventro-medial portion of hypothalamus under pharmacological effects modulating motivational and emotional status. Physiolog. J. USSR 78(10), 29-35 (1992). Abel T, Kandel E. Positive and negative regulatory mechanisms that mediate long-term memory storage. Brain. Res. Rev 26(2-3), 360-378 (1998). Barziali A, Kennedy TE, Sweatt JD, et al. 5-HT modulates protein synthesis and the suppression of specific pro­teins during long-term facilitation in Aplysia sensory neurons. Neuron 2(6), 1577-1586 (1989). Mekhtiev AA. Detection of protein with anticonsolidation properties in the rat brain. Bull. Exp. Biol. Med 130(8), 739-742 (2000). Gasanov GG, Mekhtiev AA. Revealing of serotonin-modulating protein fraction and study of its involvement in organization of passive avoidance behavior. Bull. Exper. Biol. Med 112(7), 5-7 (1991). Mekhtiev AA, Kozyrev SA, Nikitin VP, et al. Selective effects of antibodies to protein SMP-69 on the activity of defensive behavior command neurons in the common snail. Neurosci. Behav. Physiol 34 (8), 791-796 (2004). Guseinov ShB, Mekhtiev AA. The role of serotonin-modulating anticonsolidation protein in memory formation in rats in a shuttle box. Neurosci. Behav. Physiol 43(5), 551-556 (2013). Semyonova TP. The method of study of memory in the rats based on inborn reaction of sequential alternation of right-side and left-side running. J. Hig. Nerv. Sys 26(1), 1322-1324 (1976). Mekhtiev AA, Panahova EN, Rashidova AM, et al. Engagement of serotonin-modulating anticonsolidation protein in memory formation and suppression of drug addiction and epileptic seizures, Nova Science Publi­shers, New York (2015). Sudakov SK, Rusakova IV, Trigub MM, et al. Self-administration of morphine by rats induces release of amines in frontal cingulate cortex of the brain. Bull. Exper. Biol. Med 144(2), 210-213 (2007). Benito AP, Philippe LG. Preparation and use of a bivalent vaccine against mor­phine-heroin addiction. Patent EP1767221 (A2), (2007). Yevseyev VA, Basharova LA, Vetrile LA, et al. Immunotherapy of experimental drug addiction with antibodies to serotonin and dopamine. Bull. Exper. Biol. Med 122(8), 189-192 (1996). Poletayev AB. Brain-Specific Proteins of S-100 group, their endogenous acceptors and ligands, regulation of metabolic processes in nervous system: Thesis of Dissertations of Doctor of Medical Sciences, P.K. Anokhin Institute of Normal Physiology, Russian Academy of Medical Sciences, Russian (1988). Albeck D, Rose GM, Veng L. Electrophysiological effects of OX-26-NGF on medial septal neurons. Soc. Neurosci. Abstracts 22(1), 752 (1996). Garcia FD, Coquerel Q, do Rego JC, et al. Anti-peptide Y plasma immu­noglobulins in relation to mood and appetite in depressive disorder. Psycho­neuroendocrinology 37(9), 1457-1467 (2012). Fisullo G, Marca GD, Mirabella M, et al. A human anti-neuronal autoantibody against GABAB receptor induces experimental autoimmune agrypnia. Exp. Neurol 204(2), 808-818 (2007). Coplan JD, Tamir H, Calaprice D, et al. Plasma anti-serotonin and serotonin anti-idiotypic antibodies are elevated in panic disorder. Neuropharmacology 20(1), 386-391 (1999). Huber VC, Mondal T, Factor SA, et al. Serum anti­bodies from Parkinson's disease patients react with neuronal membrane proteins from a mouse dopaminergic cell line and affect its dopamine expres­sion. J. Neuroinflammation 3(1), 1 (2006).